Hill ; illustrated by Fausto Bianchi. (B Lu) Ages 4 to 7. Dorenkamp. (B Gr) Ages 4 to 8. “Miss Patty Cake’s Egg Stravaganza” (JDVD P) Ages 1 – 5. Includes songs. May your February be full of cozy times with the ones you love and may some of these books be part of those moments. Children and Jesus. Retold by Anne de Graaf ; illustrated by Jose Perez Montero. (Little Children’s Bible Books) Recommended for ages 3-6 years. (B DeG) Teaches about listening for Jesus calling each of us. Jesus, friend of children : the life of Jesus told in forty stories for young readers. English text adapted by Pat Alexander ; illustrated by Noelle Herrenschmidt. (B Al) Good short stories that could be used as devotional or bedtime reading between parent and child. The Children of the King. By Max Lucado ; illustrated by Toni Goffe. (F Lu) A fun story exploring what it means to be adopted by a king. The big 10 for little saints. By Matt & Lisa Jacobson ; illustrated by Sonya Wilson. “Helping children understand the 10 commandents” – cover. (F Ja) Beautiful illustrations and straightforward text invite discussion and understanding about each commandment. I learn about the fruit of the Holy Spirit. Written by Marie Chapian ; illustrated by Peter Chapian. (F Ch) A discussion of what spiritual fruit looks like in a kids’ life. Based on Matthew 6:3-4, “But when you give to the needy, do not let your left hand know what your right hand is doing, so that your giving may be in secret. Then your Father, who sees what is done in secret, will reward you.” A girl finds joy in doing thoughtful and encouraging things for other people. Welcome to the new year! Fresh starts and new opportunities call to us in the midst of our current habits and memories, both good and not-so-good. Our children can feel this tension as much as we do. For this month’s book review, I’ve selected some titles that deal with anxiety, hope, and encouragement to join God in creating positive change. F BA The Stormy Night / by Sanna Anderson Baker ; illustrated by Fred Marvin. Tyndale House Publishers, Wheaton, IL : c1991. Recommended for children ages 4-8. “Anna awakens and is frightened, but God speaks to her and calms her fears. Using word pictures from the Psalms, Sanna Anderson Baker paints a God who loves and cares for his creation, who is stronger than any storm, and who has time for one small child. Lavish, imaginative paintings by Fred Marvin perfectly complement the lyrical text.” – jacket. F BO The Snow Angel / Debbie Boone ; illustrations by Gabriel Ferrer. Harvest House Publishers, Eugene, OR : c1991. Recommended for children ages 2-8. Akin to Proverbs 29:18, “Where there is no vision, the people perish” (KJV), Rose and her grandfather help their fellow villagers recover hope and joy with the assistance of a snow angel who comes to life. F CA Secretly Do Good Deeds / Melody Carlson ; illustrations by Susan Reagan. (Just Like Jesus Said series) Broadman & Holman Publishers, Nashville, TN : c2002. Recommended for children ages 4-8. The Christmas books are back! Please come look over our collection for “new” holiday books & videos throughout Advent. Practice being thankful each day this month so that when the holiday arrives (with all its challenges), you’ll be a pro! Here are some books to help you: one on thankfulness as well as some that support the Sunday themes this month. It’s autumn – time for apples, pumpkins, & rain (in Baltimore this year, every season’s a season for rain)! Best to curl up with some books about classic Bible stories, characters, and concepts. Here are a few that your children should hear about during their Sunday School time. Children’s Ministry has purchased some new books for the Children’s Library – come check them out!. Now that the novelty of summer vacation has worn off and before the distraction of a new school year ramps up, is a good time to get back to the basics: the Ten Commandments. The Children’s Library has a separate section on the right side of the collection dedicated to books on the Ten Commandments. The collection contains a wide variety of age-level-appropriate books and can generate good discussions even with secondary school children as you evaluate and compare the ways that each law is explained and illustrated. (Ages 6-12) A compilation of stories that illustrate each commandment. At the back, it includes tips for parents & teachers written by Edit Schaeffer. (Ages 5 & up) Uses hand motions as a memory-aid for learning the Ten Commandments. (Ages 3-8) Provides a simple presentation and explanation of each command accompanied by a large, colorful illustration on the facing page. (Ages 0-3) This board book is made to look like Moses holding the two tablets that contain the 10 Commandments. Each side contains a paraphrase and explanation of 5 Commandments. (Ages 3-7) This version states each Command, gives an example of a story in the Bible that hinges on this Command and also an everyday example of what Command means. Enjoy the start of summer and may God bring refreshment to your soul! To help us celebrate the goodness of our heavenly Father, here’s a review of a book on The Lord’s Prayer and one on the monumental ministry that God has given to earthly fathers to reflect His character as they relate to their children. This is a board book with very basic illustrations. It contains one or two phrases of The Lord’s Prayer on each page, the words of Jesus’ prayer appearing at the top, and the author’s application of / reflection on the meaning of the phrase appearing at the bottom. Recommended for young readers. Marketed as a “Specialty / Gift Book,” the illustrations and format are very attractive and the text is geared toward new fathers. The promises of earthly fathers to their newborns are both lofty and practical. Ultimately, they reflect the character of our heavenly Father, of whom the earthly fathers’ promises emulate. On Sunday, May 20th, the Church celebrates Pentecost. Pentecost Sunday marks the day when the Holy Spirit came and rested on the disciples which made the birth of the Early Church possible. The Holy Spirit may well be a difficult concept for children to grasp since, by nature, a person cannot see, feel, or touch Him. Quite honestly, it’s a difficult concept for adults, too. Thankfully, we have a couple books that may help adults explain the person and workings of the Holy Spirit. Laid out as an elementary-age boy’s description of the Holy Spirit. The book uses scripture references at the top of each page as references for what the boy relates about the Spirit’s role throughout history, characteristics, and work in his life. The illustrations and word choices make it appropriate for all elementary levels. The book overviews the growth of the early church after Pentecost. It begins by focusing on Peter’s ministry and then moves on to Paul’s, mirroring Acts’ layout. Additional teachings on living by faith and the fruit of Spirit are interspersed in the text. The book seems appropriate for older elementary students. Christ is risen; He is risen, indeed! Happy Easter! Little Rose of Sharon by Nan Gurley ; illustrated by Tim Jonke. (F Gu) “A story of self-sacrifice …,” this book tells the story of a lovely rose whose act of generous sacrifice reveals an even greater beauty in her heart. The kids I know all seem to like stories. Since I also like stories it’s a great way to connect. Jesus apparently like stories too and used them to teach people who came to Him. A Child’s Book of Parables illustrated by Trace Moroney ; retold by Lori Froeb. This book retells seven parables, making them age-appropriate for very young children. Each short story is accompanied by one or more large, child-friendly illustrations as well as a scriptural reference. Once Upon a Parable: timeless stories about God’s Kingdom by Mack Thomas. The author has created a series of stories that reflect the concepts of sixteen Biblical parables. Each re-telling would work well as a bedtime story. The book is attractively laid out and illustrated, too. Since the stories are adaptations, a scriptural reference accompanies each one for clarity. A Valentine’s gift from God? Perhaps this is another way we can think of Jesus and the way He has brought the Father’s grace and mercy into our lives and to the world in general. Since this is a difficult concept for anyone to comprehend, Here are some suggested titles that might help you and your children comprehend His love more. Love Your Neighbor by Melody Carlson (F Ca). Recommended for ages 4-8. I’ll Love You Anyway & Always by Bryan Chapell (F Ch). Recommended for ages 3-8. I Couldn’t Love You More by Jason Ingram & Matt Hammitt (F Ha). Love Is … adapted … by Wendy Anderson Halper (B Ha). I Love You, God by P. K. Hallinan (F Ha). I Love You This Much by Lynn Hodges & Sue Buchanan (F Ho). Includes CD. Recommended for ages 3-6. The Best Thing is Love by Linda Parry (F Pa). Recommended for ages 1-4. “Where to start?” Many things can make us ask this question and one of those times is when your child asks you to tell them about faith, love, or eternity. Thankfully, author Joel Anderson addresses these issues in his “big topics for little kids” series which can be found under F An on the Children’s Library shelves. Each book explores its topic through an analogous story, both in word and art. The text remains simple and accessible but highlights the characteristics of the topic it’s exploring. Each book opens and closes the story with a verse of relevant scripture and then finishes the book with a discussion aid and activity to deepen understanding of the abstract ideas discussed. Check them out and see if they help you start a good conversation with your children (or anyone) this new year! Tell Me About Eternity by Joel Anderson (F An). Tell Me About Faith by Joel Anderson (F An). Tell Me About Love by Joel Anderson (F An). Little Rose of Sharon : a story of self-sacrifice by Nan Gurley. When the little rose of Sharon sacrifices her beautiful red petals to save a baby dove, she hears the Creator say that her love is like that of His Son. For God So Loved the World : my John 3:16 Book by Dandi Daley Mackall. Incorporating many blessings we experience as Christians, the text and illustrations remind the readers that we enjoy these blessings because of God’s gift to us in the life and death of Jesus. It also presents the first part of John 3:16 in nine different languages. The Legend of the Three Trees based on the screenplay by George Taweel and Rob Loos. (picture book) adaptation by Catherine McCafferty; (board book) Text by the staff of Tommy Nelson. A timeless retelling of the classic folktale of three distinct trees, each with its own hopes, dreams, and aspirations and how they find fulfillment through their interaction with Jesus Christ. Prayer for a Child by Rachel Field. Recommended for children ages 4-7, this book could be read by early readers. Using items from everyday life, the prayer includes gratefulness, intercession, and trusting in God’s protection. The Lord’s Prayer by Alice Joyce Davidson. Formatted for parent-child sharing, this book incorporates the Lord’s Prayer into a story about girl’s Bible-reading time. As the girl reads the prayer she also reflects on each line, expanding on the concept that it highlights. Bible Prayers for Bedtime by Jane Landreth. For several nights of prayer material, this 253 page book is a great one to share. The author prefaces each prayer with a Bible verse and some explanation that can be read by an adult and concludes with a simple prayer that can be recited by the child. The illustrations and layout are bright yet simple and create interest without detracting from the meat of the text. 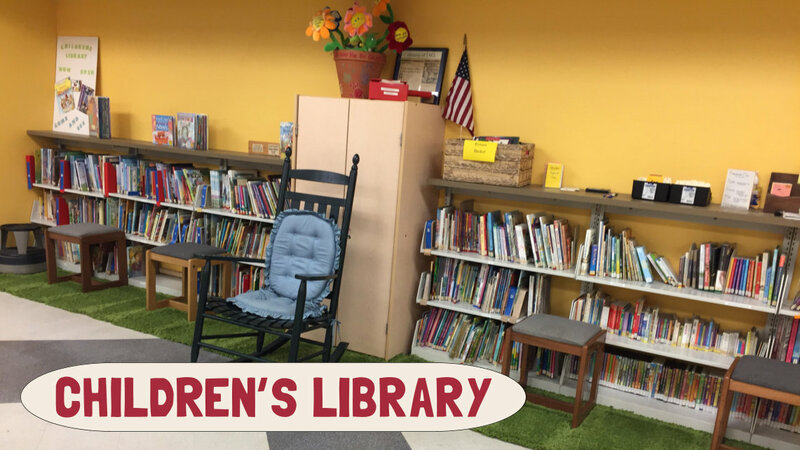 Last year, the Children’s Library moved into the hallway outside of Route 45 so that it might be more accessible to all children and their parents as they move around the Children’s Ministry area. Please stop by to read some beautiful books while you wait or sign some out to enjoy at home! ** Note that some of our books have been arranged in topics such as “Prayer”, “Devotionals”, “Holidays”, etc. Also, our DVDs are on the lower shelves under the check-out area and there is a shelf of small board books on the shelf above that.